Smooth instrumental music, perfect for one of my wife's candlelight suppers. Both my wife and I love the British TV Comedy "Keeping Up Appearances". 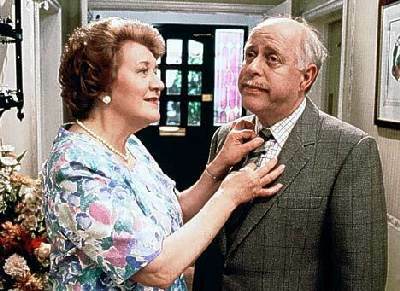 My wife is not a snob at all, but she has other similarities with Mrs. Hyacinth Bucket. Like when we invite friends for dinner and she will cook for 2 days to impress them. Or when we go to the opera and I will let her choose which clothes I am wearing. Last Friday was my 25th anniversary at Motorola Solutions, and we were going to a reception at which I was to wear shirt, jacket, and a tie. Problem was that thanks to several candlelight suppers I could not close the top button on any of my shirts, so I rushed down to the mall and came home with two new shirts. And as I came in I said: "Hyacinth, I bought two so you could feel you made the decision of which shirt I should wear". She had already chosen my pants, tie, and jacket.